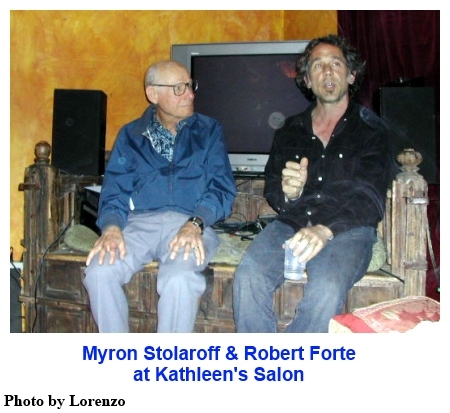 This is a recording from the spring of 2006, at Kathleen’s Salon in Venice Beach, California, where Robert Forte and Myron Stolaroff came to tell their stories about the recent festivities in Basil, Switzerland celebrating the 100th anniversary of the birth of Dr. Albert Hofmann, the discoverer of LSD. After telling a little about the Hofmann event, Myron read part of the talk that he gave in Basil. From there, the conversation ranged widely, eventually ending with an argument about the Kennedy assassination. Posted in Albert Hofmann, Consciousness, Culture, LSD, MDMA, Myron Stolaroff, Psychedelics, Robert Forte. Dr. Hofmann has saved the lives of countless women from not bleeding to death during childbirth. There is no end to the benefit that humble man has to the human population. Myron, I miss you. Your heart of gold was as at least as large as the room containing it, and it was always felt no matter the conversation or the occasion. You inspire the very motion within me. Thank you for your contribution to those people willing to confront their limits so that they could exceed the very limitation of what it is to be human, (including such people as Spalding Grey). Your relationship with Leo Zeff was no coincidence or mere happenstance. The Secret Chief was a monument to the underground truth movement forever. Everyone needs to know how you and the Stanford group like Dr. James Fadiman and everyone else involved pioneered a truth regarding the efficacy of the medicine path and the Cultural Creatives who have shaped the digital age from the depths of the psychedelic state. You all have my sincere gratitude and exaltations. Dr Albert Hofmann would be a remarkable man even if he hadn’t discovered the chemical compound that changed the course of the 20th century: LSD. Hofmann’s chemical creations also include chemicals used every day in maternity and geriatric wards the world over.